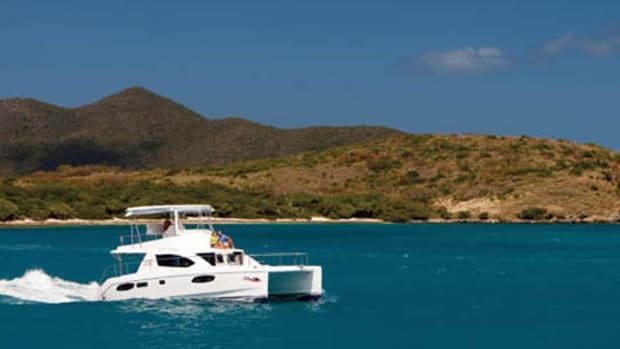 The best way to settle into a Caribbean charter vacation may just be to watch the sun set behind a private island while drinking a rum punch on the deck. Shoes are forgotten, the airplane air leaves your skin, and the salt-tinged breeze blows away any stress that could have made the journey with you. 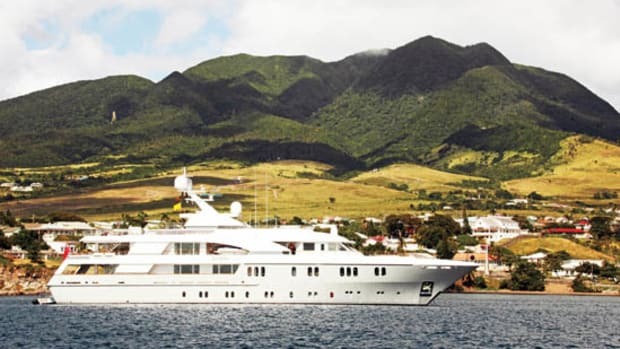 For me, that journey ended at Encore, a 150-foot Trinity, anchored just off Guana Island in the British Virgin Islands. The last leg of the trip was a short hop from San Juan, Puerto Rico, to Tortola, that landed me in the capable hands of Capt. Roy Hodges and deckhand Morgan Thursfield. The van ride from the airport to our tender was too short even to find the seatbelt. At the dock, the rest of my cruising companions were gathered in the bow of Encore’s 30-foot Intrepid, getting a head start on that sea breeze. I joined them and we were off. I’d be spending the next four days aboard with fellow guests Allison Cecilio, International Yacht Collection’s manager of the yacht; Rebecca Riley, charter broker at Paradise Yacht Charters; Tim Nelson, charter broker at Seven Seas Yacht Charters, and his wife Cathy; and photographer Jim Raycroft. 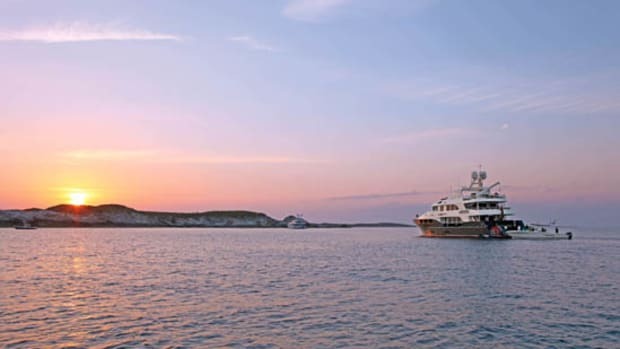 Encore’s successful charter program began well before the current owner bought her five years ago. 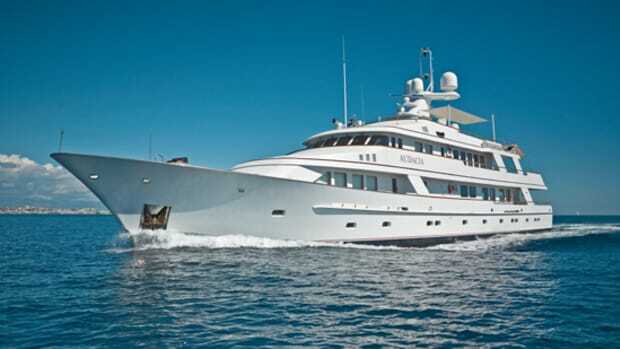 But, the new owner is passionate about his yachts, and he wanted Encore to offer the best charter program out there. So he started with an interior redecoration of the main saloon as well as some more substantive projects. “It had a darker, masculine interior prior to them buying it,” Hodges says. “The owner and his wife came in and they changed a lot of the fabrics and they really brightened it up a lot.” Even more appealing were the aforementioned substantive modifications. “They added some things like [Naiad at-anchor] stabilizers—that was a pretty big deal,” Hodges continues. “They put the VSAT system on the boat, so now we have Internet under way and at anchor. 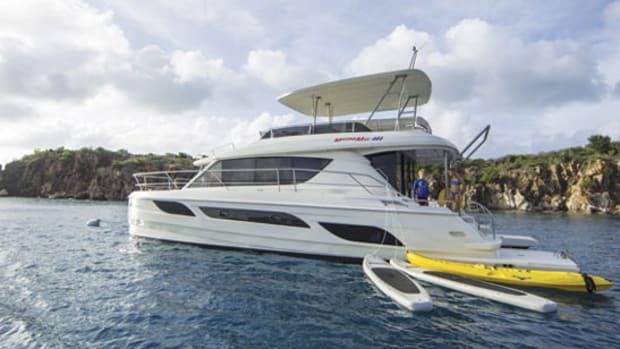 And they upgraded the Wi-Fi system so it works better throughout the whole boat.” The owners also refreshed electronics and updated the entertainment system on the yacht. What Hodges seems to leave out though, is the owner’s most important decision: Choosing a captain to command the vessel. 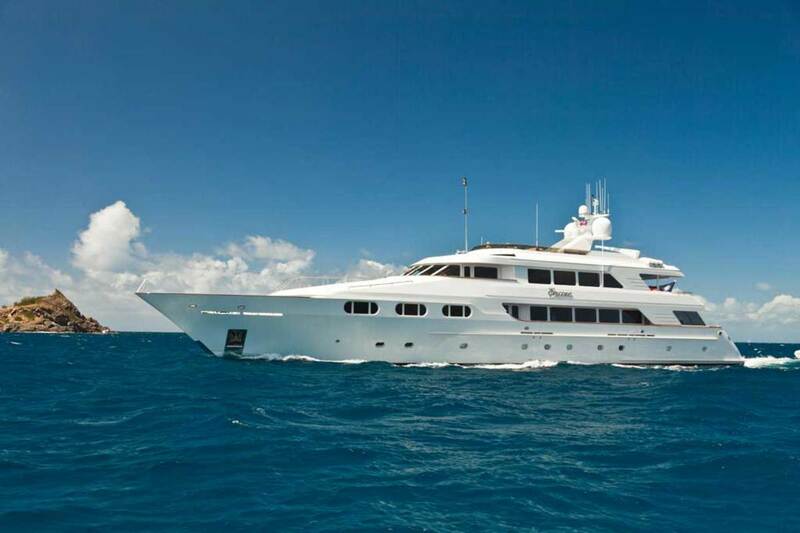 Hodges is a sought-after charter captain, who was running a ten-year-old Christensen when she won Best in Show at the 2009 St. Martin Charter Show. All guests like to eat, and our group was no exception. Stewardess Anaïs Levert, who learned floral design while growing up, set the table with blue sea glass and flowers. And the guests soon got acquainted over a dinner that featured bacon-wrapped filets with truffled mashed potatoes. After a long day of traveling and with full stomachs, we retreated to our cabins. Ensuing activities would alternate between watersports and meals, basically my idea of the recipe for a perfect day. First, eggs Benedict. Then, snorkeling off Guana Island’s Monkey Point, where parrotfish swam among the fan coral. Next, we tucked into chili-dusted mahi-mahi while the yacht cruised to Norman Island. Here we had a short safety lesson, as Lesmaityte led a scuba refresher course. Then, back in the water for a quick snorkel while Allison, Tim, and Cathy rediscovered scuba. We were near a formation called The Caves off Norman Island’s eastern end, which are narrow slips worn into the rock. Jim and I grabbed our masks and kicked over; our progress through the turquoise waters was followed by schools of tiny fish. Tiny crabs crawled on the walls of the first cave and the deeper waters of the second were filled with needlefish, which seemed not to know that they were supposed to be more afraid of us than we were of them. Okay I admit it: The curious, pointy-looking fish chased me out of the cave. After our day of underwater exploring, cocktail hour was scheduled for Willy T’s, a bar and restaurant on a steel-hulled schooner anchored in The Bight around the corner from The Caves, for our first painkiller of the trip. At night, Willy T’s is the kind of place where vacationing dentists do body shots off their girlfriends. But at dusk, the bar is relatively sedate. After a few fruity rum drinks chased away the memories of my harrowing needlefish encounter, we made our way to the Intrepid to head back to Encore for dinner. The next morning, a rain shower woke me, but it cleared before chief stewardess Cassie Thibeau served the coconut French toast for breakfast. 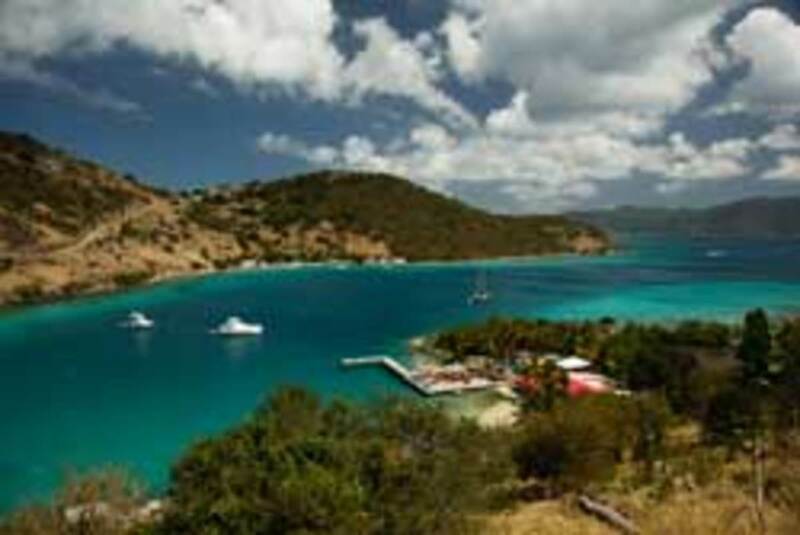 Thursday was spent on the island of Jost Van Dyke, home of Foxy’s and the Soggy Dollar Bar. Now up until this point, I had thought that we were getting along well with the crew. We weren’t staying up too late or waking too early, and we were polite. But I am no longer certain the crew wanted us around after what transpired on our visit to Jost Van Dyke. Here’s what happened: The captain arranged for the driver of a red Ford Explorer, Claude, to give us a tour of the island. Claude drove us to Foxy’s Taboo, where we had cheeseburgers and Caribs for lunch. Afterwards, Claude turned right and took the high road. Actually, calling it a road is generous. The rocks that were once the road were piled haphazardly at an incline steep enough to press your back into your seat. The view from the top was spectacular, and Encore looked tiny at anchor. But what goes up must come down: On the downhill leg the road fell away so quickly it wasn’t visible ahead of the hood of the vehicle. (The road also wasn’t visible when your eyes were squeezed shut tight—as everyone in the Ford except Claude could attest.) You could hear the rocks slipping away from beneath the tires. Fortunately the Soggy Dollar Bar on White Bay was at the end of the road and it was time for another painkiller. This place lives up to its name: It’s a beach bar that’s little more than a roof and two walls where sandy patrons offer up the soggy dollars in their pockets after coming ashore from their moored boats. That night on Encore, Chef Jean-Paul Barcena presented us with braised short ribs and mashed potatoes, and we ate as if we had faced our own mortality. Eating while underway must aid digestion, as there was room for breakfast the next day. I was glad I fueled up, since Thursfield and Chief Officer Aaron Hersom took us to the beaches surrounding The Baths of Virgin Gorda. Thursfield led us through the twisting paths between large boulders and ankle-deep water. Steep stairs and narrow passages meant most routes could be used only by one person at a time. 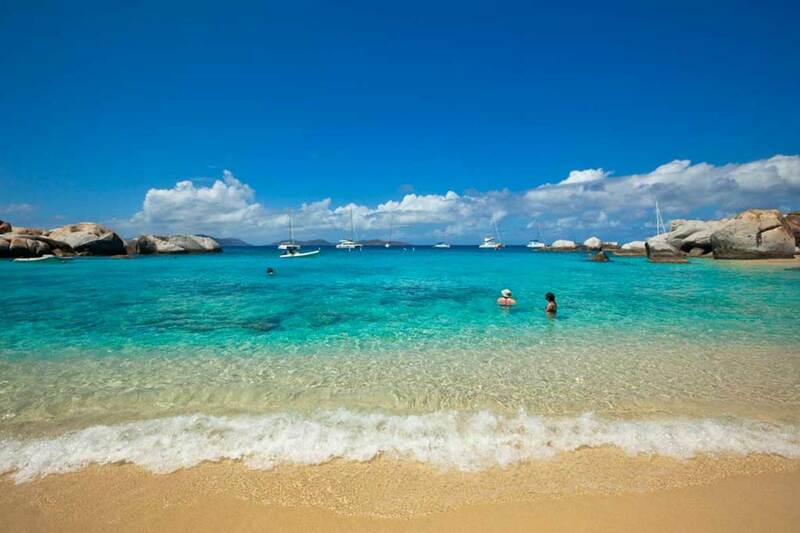 Luckily no one in the BVI is in a rush. That afternoon, it was time to get back into the water—whether I meant to or not. Hersom gave Allison, Tim, and me a standup paddleboarding lesson. Not that I have ever been called graceful on land. But on a paddleboard, I was told I was “Elvis’ing”—that’s where your legs wobble like those of the King himself—prior to experiencing some “spillage”—that’s when you tumble head first off your board in front of the other guests, crew, and a photographer. Tim was a natural and paddled circles around us, quite literally. Our last day onboard we explored the Biras Creek and Bitter End Yacht Club resorts on Virgin Gorda. Wandering the beautiful grounds at Biras Creek, and seeing the happy young families enjoying the Bitter End, I began to realize that I would soon be heading back to New York. That thought, combined with the heat of the day, knocked the stuffing out of me, and I began to feel the stress of deadlines and real life creeping in. Not long after I’d come back onboard, Giedre trailed a line off the swim platform and I dove off. Clinging to the line, I leaned back and let my toes point up to the sky, where I’d soon be flying back to reality. But, for just a moment, the world was silent and perfect. 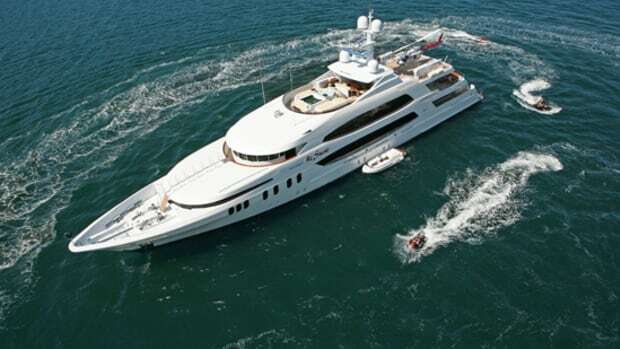 This article originally appeared in the Novembe 2012 issue of Power & Motoryacht magazine.